Restore the look and feel of your home or business with our affordable selection of laminate flooring. When you decided to replace the fading and cracking floors in your home, visit our expansive flooring showroom and speak with one of our friendly sales associates. Our primary focus is on ensuring you are completely satisfied with every aspect of your flooring purchase. Listening to your needs helps us identify the right laminate flooring option for your home. With so many color, finish, design, and style options, you are sure to find the laminate wood flooring or laminate tile flooring that best suits your needs in looks, performance, and price. Innovations in laminate floors make it possible to create the look of such high-end flooring as hardwood and natural stone. When you get more value for your flooring dollar, you are able to broaden your design horizon and cover even more rooms for less. With our help it is possible to get the durability and affordability you need, without sacrificing the modern look you have in mind. Getting the character and warmth of hardwood floors in your home is now more affordable than ever when you choose our laminate wood flooring. This cost-effective option provides you with the natural sophistication of wood, and it has the strength to endure heavy traffic and moisture. The traditional look of wood also works well with a wide range of design themes you may have in mind. Bring in your design plan and any samples you may already have, and we can match them with a variety of laminate wood flooring you are sure to fall in love with. 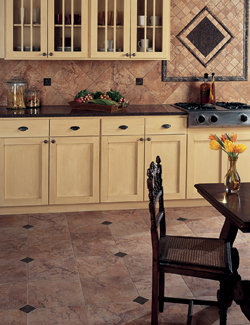 Bring your kitchen and bathrooms to life with our laminate tile flooring. When you are ready to impress your guests and leave a lasting impression on your neighbors, this versatile flooring option is an affordable solution. This flooring product is easy to clean and replace should there be any damage to a particular tile. You can add considerable value to your home with laminate tile flooring, and the look is exceptional. When your bottom line is important, adding new laminate floors can be a quick and easy way to freshen up the appearance of your business. Shiny new floors may even boost the morale of your employees! Whether you are renovating your home, or completing construction on your new business location, this value-added flooring option can make a difference. Protect the value of your new flooring investment by working with our skilled and certified laminate flooring installation team. Getting the right fit is critical in extending the life and looks of your flooring purchase, and we have the team that gets the job done right the first time. With competitive pricing on floors and laminate flooring installation, there has never been a better time to restore the value of your home and business. Contact us today for a free estimate on the pricing for the new laminate flooring you have been dreaming of. We proudly serve customers in Covington, Abita Springs, Madisonville, Mandeville, and Lacombe, Louisiana, and surrounding areas.